View a map of the trail extensions and how you can donate to Phase II of the Fort Dodge/Webster County Trail System Project. With more than 20 total miles of trails, the Fort Dodge/Webster County Trail System currently connects seven parks, three schools and the riverfront. It serves as an illustrious showcase to visitors to our area and a source of pride for our community. Quality, well-maintained trails mean healthy communities, connected neighborhoods, active families and enjoyable recreation. However, great trail systems don’t just happen. They need the support of many voices. In 2006, the board of the Development Corporation of Fort Dodge and Webster County (now the Greater Fort Dodge Growth Alliance) established a task force to develop a comprehensive trail system plan for the community and identify resources and funding opportunities to bring the plan to fruition. With this vision in mind, the Trails Advisory Board was created, forming a cross-sector partnership of public, philanthropic, business and community members working together to improve the quality of life for all citizens of Fort Dodge and Webster County. The Trails Advisory Board evaluated a number of different options and ultimately developed a comprehensive trail plan that offered the best option for a high-quality, cost-effective trail system based on costs, land acquisition and other logistics. Over the past several years, more than 15 additional miles of 10-foot wide concrete trails have been created in accordance with this plan. The Fort Dodge/Webster County Trail System expansion is a culmination of funding support from private individuals and businesses, state grants, federal Greenbelt funds, the City of Fort Dodge and the Webster County Board of Supervisors. A major funding source for the $6.7 million trail plan was a $1.2 million Vision Iowa grant that was secured in 2010. To meet the grant requirements, $400,000 in private funding needed to be raised in 120 days. Led by the fundraising efforts of the Fort Dodge Community Foundation, the funds were secured, further demonstrating the community’s ability to work together in a public-philanthropic partnership. The beauty of the trail system is that it is free and accessible to everyone with all neighborhoods having access to a trail. The trail system has seen a large increase in usage by people of all ages and population sectors. 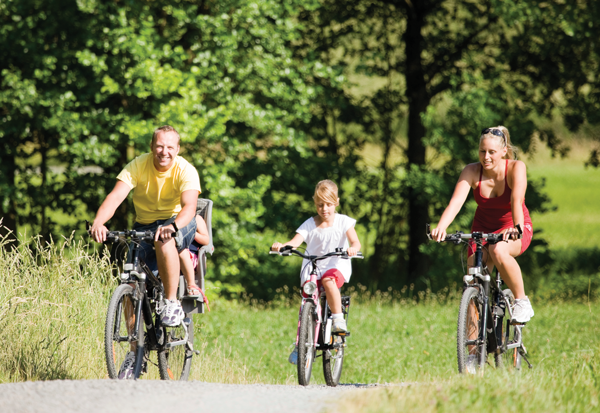 Individuals and families can be seen walking, jogging and biking daily on the trails. Although the first phase of the trail system expansion was completed in the summer of 2015, the Trails Advisory Board continues to work in partnership with the City of Fort Dodge, Webster County and the Fort Dodge Community Foundation with ongoing development. Additional trail connections are being planned that will expand access to the trail system and link together even more neighborhoods, parks and community amenities. Communities all across America have found that good, well-maintained trails can promote safe and livable communities. Right here in Fort Dodge, the trail system brings together three important community elements: recreation, health and fitness and economic development. Trails add character to a community and reinforce a community's desirability as a place to live, work and play. Trails encourage people to enjoy the great outdoors and embrace activity. Trails are also valued for their ability to connect people with places and to nature itself. They provide safe and enjoyable access to nature areas, parks, green spaces, rivers, lakes and other recreational venues. The trail system is also a quality of life amenity that employers can utilize to attract highly-trained and highly-skilled workers to the community, as it serves as an indicator of the community's investment in health, vitality and quality of life. The Fort Dodge and Webster County Trail System will be enjoyed by youth, adults and families from all populations of the community for generations to come and serves as a model example of public-philanthropic partnership, as it could not have been developed without the collaborative support of the City of Fort Dodge, Webster County, the Webster Conservation Board, the Fort Dodge Community Foundation, the Greater Fort Dodge Growth Alliance, numerous volunteers and the spirit of this giving community.